Hot chocolate means one thing in my world: the holiday season has arrived. 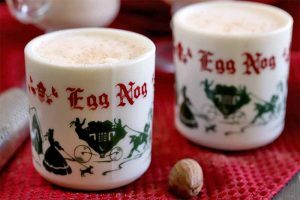 Cuddling up with a mug of hot cocoa in your Christmas pj’s is one of the things I look forward to all year long. 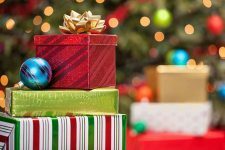 I have been waiting for the holiday season to roll around since New Year’s Day last year, when I wasn’t ready for it to end. Now that it is officially in full swing, I am not stopping the celebration until January. 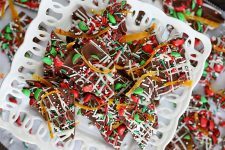 The Christmas movies are queued up, the records are ready to be spun, and my oven is doing overtime with all the cookies I’m baking right now. If there is anyone who could listen to Christmas music 24/7, it would be this gal. There’s something about this season that will always put me in a good mood, no matter how terrible I might be feeling otherwise. 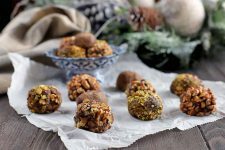 And this recipe can help too. 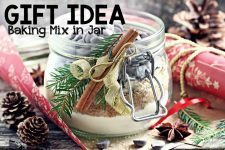 This mix is such a fantastic gift idea for anyone who likes to give something that’s homemade. 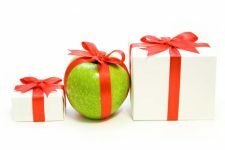 Personally, I think the gifts that we take a little extra time to create ourselves are all the more meaningful to people that we give them to. It shows that you care, even if it is something as simple as hot chocolate. 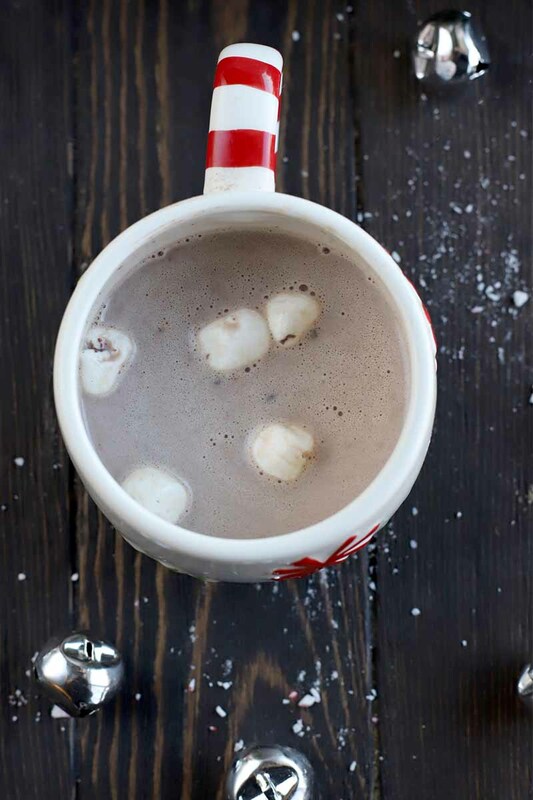 It’s the kind of hot chocolate that makes you feel like you could be on The Polar Express. Did anyone else love that book as a kid? I am not a huge fan of the movie because the animation creeps me out (anybody with me on this one?) 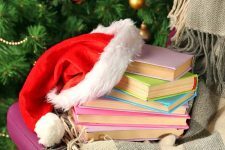 but whenever my mom would read that story to me, I loved the part when the kids got on the train and guzzled delicious servings of hot chocolate. 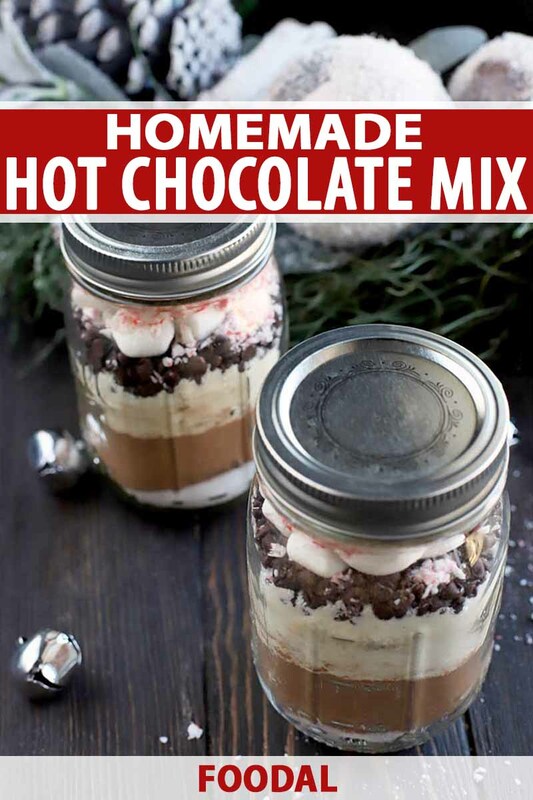 This hot chocolate mix is just like that, especially when it is made with milk. 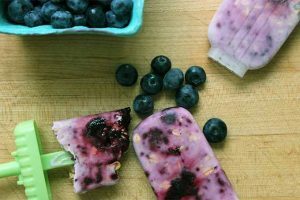 You can also make it with water, but it won’t be quite as creamy. 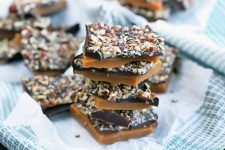 Balanced and packed with excellent chocolate flavor, I like the option to add peppermint candy to the mix. 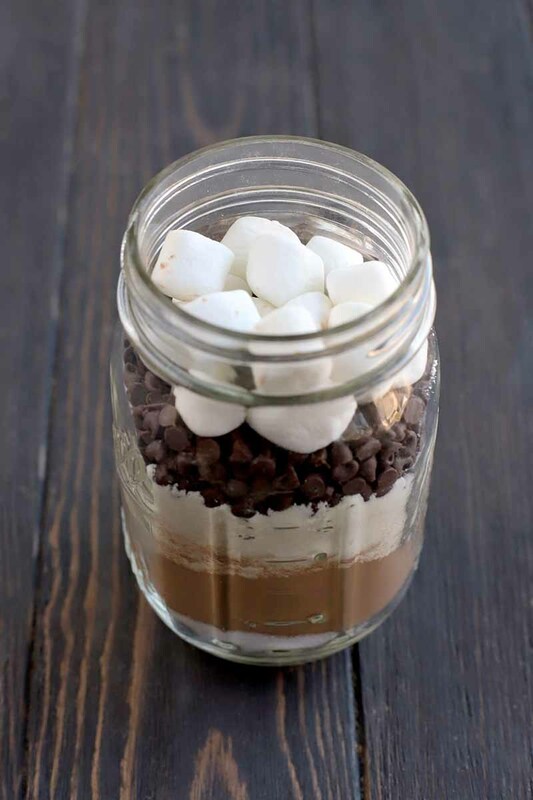 You can customize your own with extra chocolate or marshmallows instead, if you like. 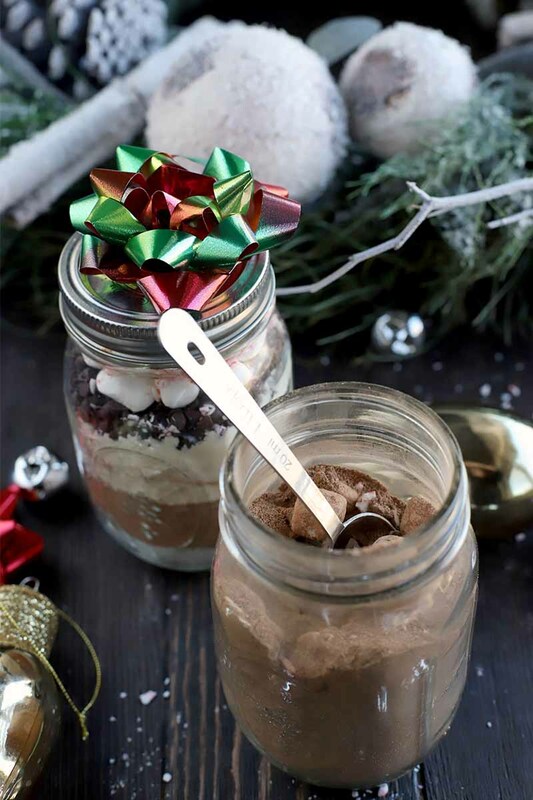 All you have to do to make this a standout gift is layer up the ingredients, seal the jar, and decorate with a ribbon. You can type out the instructions to make the cocoa and print the tag, or you can hand write it if you are creatively inclined. 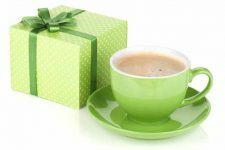 For a fun add-on idea, you can give the gift of a festive mug or even a monogrammed drinking vessel with the recipient’s initials. 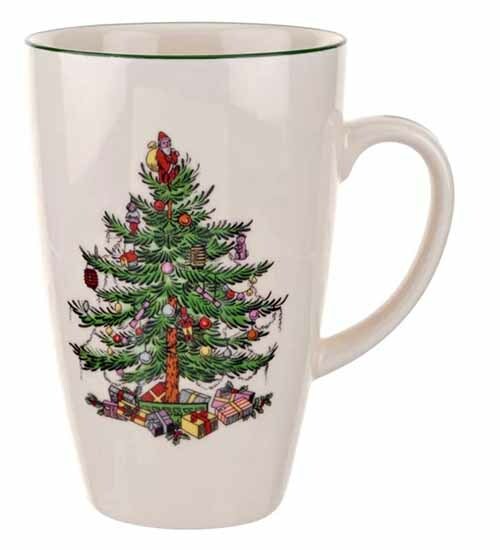 These christmas tree mugs from Spode are perfect, and they’re available from Wayfair. 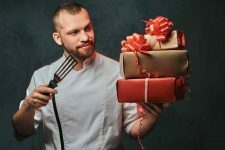 The only question is, who will you gift this lovely present to? 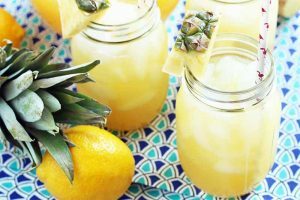 You can spend an afternoon easily whipping up several of these jars for gifts to have on hand when you need them for upcoming holiday gatherings. 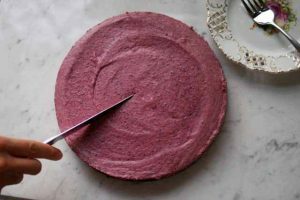 This makes a lovely option to offer the host at the next potluck or cookie party that you attend. 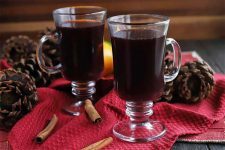 Craving a hot cup of cocoa? 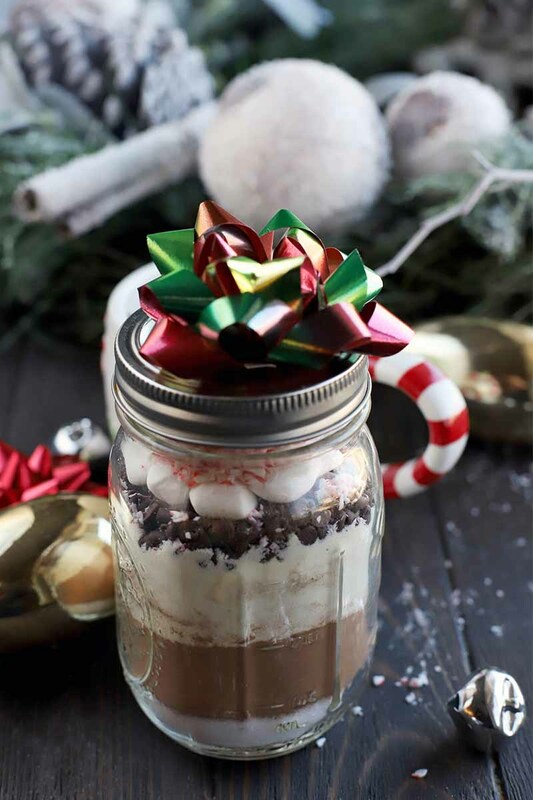 Gift your loved ones with a homemade mugful of happiness and make our hot chocolate mix in a jar. 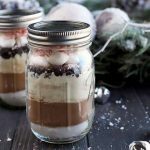 In one clean and dry quart-sized jar (or divided between 2 pint-sized mason jars), layer the sugar, cocoa powder, powdered milk, chocolate chips, and sea salt. 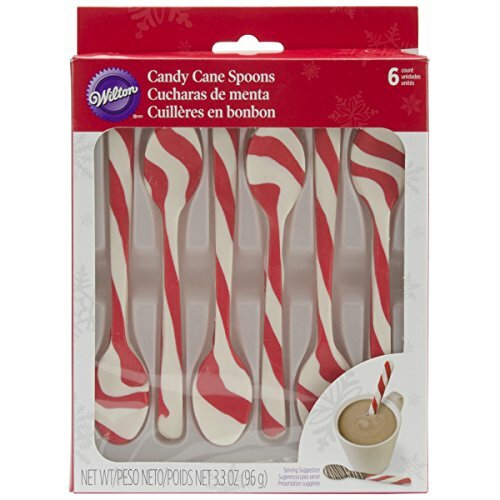 Top with the marshmallows and crushed candy canes if using. Seal with a tight fitting lid. Print or hand write the instructions below on a label and affix to the jar with ribbon. Shake the cocoa mix vigorously. 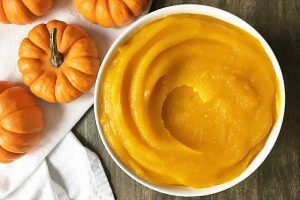 Place 2 tablespoons of mix in a mug. Stir in 2 fl. oz. hot water or hot milk until combined. Fill the mug with 6 fl. oz. additional hot water or hot milk. Stir to combine. Top with additional marshmallows as desired. Enjoy! Nutritional information reflects beverage made with whole powdered milk and whole liquid milk. 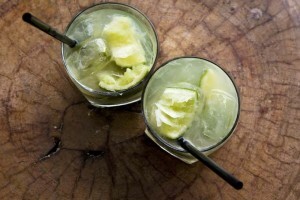 Low-fat or nonfat versions may be substituted. 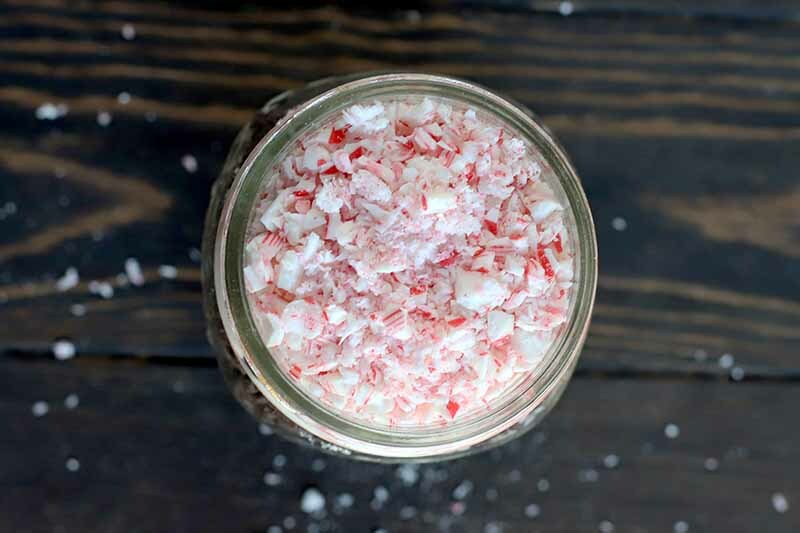 Crush enough candy canes or peppermint hard candy with the smooth side of a mallet or a rolling pin until you have 1/2 cup in total. You can use homemade marshmallows, and feel free to include an oxygen absorber dessicant packet to help with moisture absorption. Just be sure to indicate on your label that this should not be eaten. Or, if you want them to have an even longer shelf life, use dehydrated marshmallows. 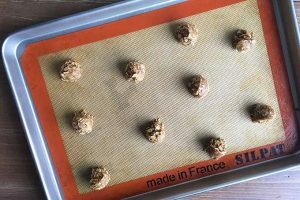 You can make these at home as well, in a home food dehydrator! 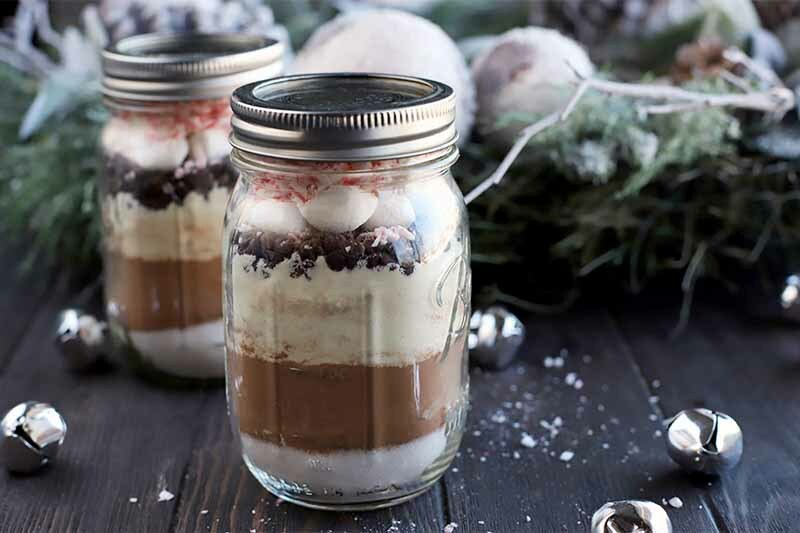 In one clean quart-sized jar (or divided between 2 pint-sized mason jars), layer the sugar, cocoa powder, powdered milk, chocolate chips, and salt. 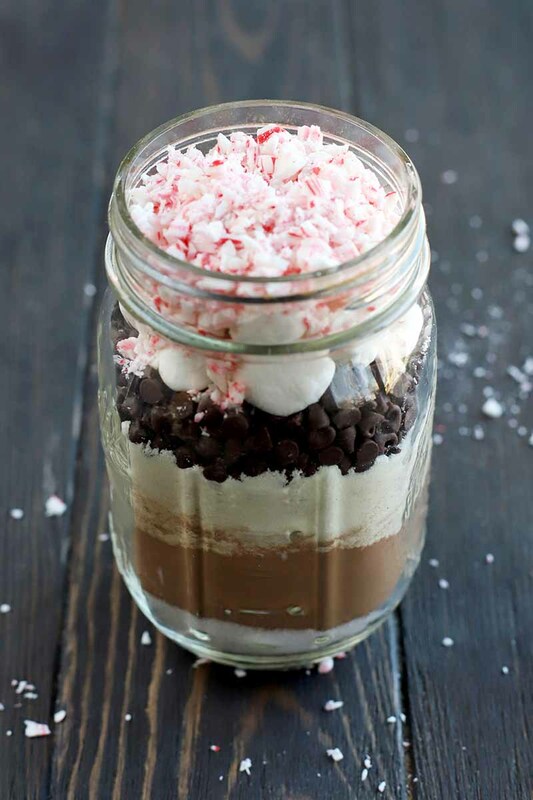 Add marshmallows and crushed candy canes, if you are using them. Seal with a tight-fitting lid. 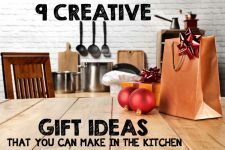 For those who are less crafty (like myself!) top with a premade bow. 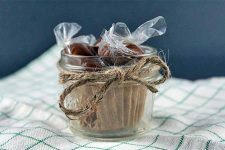 Tie a ribbon around the neck of the jar and affix with a handwritten label detailing the instructions to make a mugful. Use a chalkboard label to outline the instructions and adhere to the jar. 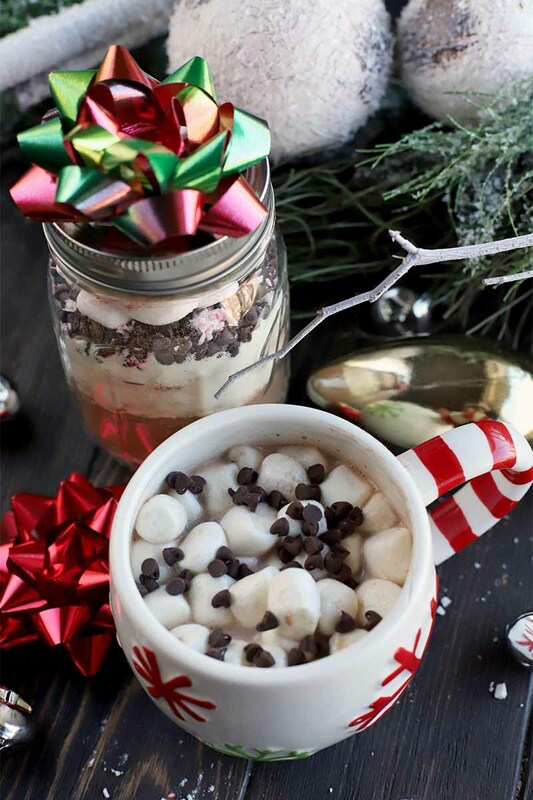 Make a gift basket with the hot chocolate mix, extra homemade marshmallows, candy canes, cookie stirrers, chocolate chips, and other fixings for a homemade hot chocolate bar. 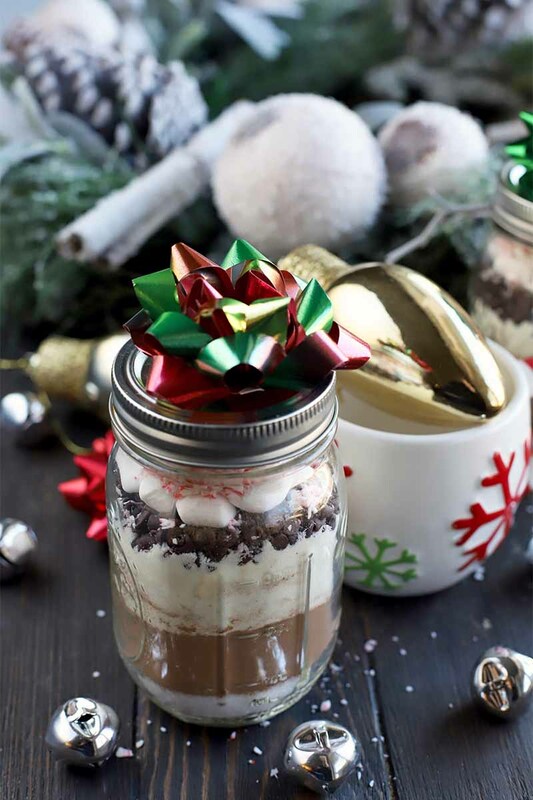 How would you choose to decorate and gift these jars of deliciousness? Tell us in the comments below, and be sure to come back to rate this how-to once you make it yourself. Photos by Meghan Yager, © Ask the Experts, LLC. ALL RIGHTS RESERVED. See our TOS for more details. Product photos via Wayfair and Wilton. Adapted from an article originally published by Lorna Kring on December 16, 2015. Last updated: November 20, 2018 at 21:59 pm. With additional writing and editing by Allison Sidhu.